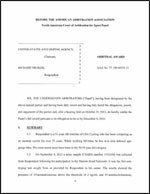 USADA announced today that a three-member panel of the American Arbitration Association North American Court of Arbitration for Sport (AAA), rendered its decision in the case of cyclist Richard Meeker, finding that Meeker committed an anti-doping rule violation, and will serve a two-year suspension. Meeker, 51, of Corona Del Mar, Calif., provided a urine sample on September 6, 2012, after participating in the Masters Road Championships competition held September 5-9, 2012, in Bend, Ore. His sample resulted in an Adverse Analytical Finding for 19-norandrosterone and 19-noretiocholanolone, which are metabolites indicating the use of a prohibited anabolic steroid. Anabolic agents, including anabolic steroids, are prohibited under the World Anti-Doping Agency Prohibited List, which has been adopted by the USADA Protocol for Olympic and Paralympic Movement Testing and the rules of the International Cycling Union (UCI). Meeker’s two-year period of ineligibility began on September 6, 2012, the day his sample was collected. Meeker sought a reduction in his sanction during the AAA hearing, but the Panel declined to reduce his period of ineligibility after concluding that he had failed to establish the source of the prohibited substance in his sample. As a result of the doping violation, Meeker has also been disqualified from all competitive results achieved at and subsequent to the Masters Road Championships competition, including forfeiture of any medals, points, and prizes.